Sitting in the auditorium at Etowah High School on February 22, 2002, I, along with the entire 8th grade class, was anxiously awaiting the arrival of Jack Mandelbaum, Holocaust survivor, and cofounder of the Midwest Center for Holocaust Education. Little did I know that Jack's story would profoundly touch my heart and help me to make some sense, not only of the Holocaust, but also of an event that was happening in the small Northwestern town of Noble, Georgia. You see, earlier that week, I had been at the Tri-State Crematory helping with the removal of human remains which had been sent to the property to be cremated and were, instead, strewn about like trash. I had never even seen a dead body before and, I had certainly never seen a body left on an old rotten wooden gurney to decompose amongst old cars and church pews. Luckily, I had Jack Mandelbaum's narrative to listen to and, as he described the atrocities that he faced every day while in the Nazi concentration camps, I was comforted with the knowledge that he was sharing his experiences with us, in person, and in the book Surviving Hitler: A Boy in the Nazi Death Camps. Children's nonfiction history author, Andrea Warren tells the true story of Jack Mandelbaum, a Polish Jew, who recounts a time in Poland before the Nazi occupation, to his liberation, to his current life. 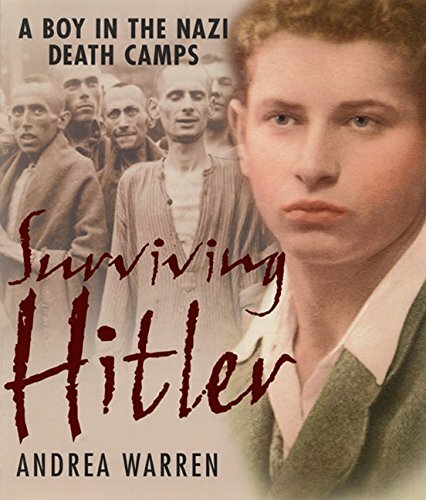 Warren has won several awards for Surviving Hitler including the American Library Association Robert F. Sibert Honor Book for Most Distinguished Information Book for Children and the Gold Medal for Children's Nonfiction, National Association of Parenting Publications. Other books by Warren include Orphan Train Rider: One Boy's True Story, Pioneer Girl: Growing Up on the Prairie, and We Rode the Orphan Trains. Warren has a new book due to be published in 2004. Constructed for ages 10-14, Mandelbaum's narrative is rich and powerful with first hand knowledge of Hitler and the Nazi regime. In the beginning, Jack recalls growing up in Gdynia, Poland; he describes himself, his parents, sister and brother as being a close and loving family. Then, in August of 1939, Jack details the Nazi's arrival in Poland, and his subsequent separation from his family. He never saw them again. Later, Jack recounts his transportation to Blechhammer, Gross-Rosen, and Auschwitz concentration camps. Throughout his ordeal, Jack remembers the special friends he made as he struggled to survive, not only the beatings from the Nazi's, but also the deplorable conditions in the camps such as: dysentery, typhoid, and starvation. Amazingly enough, during Jack's entire time at the concentration camps, he maintained an attitude of forgiveness towards his captors; this attitude is what kept him alive. And as readers of this book will discover, it is a story about more than just the Holocaust; it is about what we can learn from one person about grace, compassion, and survival. © 2003 Judith L. Hawley. All rights reserved. Receiving awards from the Georgia Bureau of Investigation and Georgia Emergency Management Association for her work in the recovery efforts at the Tri-State Crematory in Noble, Georgia, Judy Hawley, a Probation Officer in Cartersville, Georgia, is currently working on a second degree in English Education at Kennesaw State University.